Healthcare Facilities Today is a website used by health care facility managers, engineers, architects, designers, and constructors responsible for the construction, renovation and operations of hospitals, medical clinics, and nursing homes. Each day the website reports on industry news, facility management and operations practices and product information. HealthcareFacilities.Com serves facilities and construction executives responsible for the largest healthcare facilities in the United States and Canada. Who Visits Healthcare Facilities Today? Average age is 56 years. 43% will undertake the new construction of buildings in 2019. 77% will undertake the renovation, retrofit or modernization of buildings in 2019. HealthcareFacilitiesToday.com averages more than 15,000 unique visitors per month and 35,000 page views per month. Maximize your visibility and increase brand awareness among its influential audience of architects/designers, operations managers, building owners and facility managers. Healthcare Facilities Today Run of Site Advertising targets Healthcare Facilities professionals while they are on a trusted website that relates to their profession and to the products being sold. It is the combination of those things that makes having an ad on the Healthcare Facilities Today website a critical place for brands who want to generate sales in this marketplace. Healthcare Facilities Today is the best place to get in front of key facilities professionals, and we can help extend your message by targeting health care FMs all across the web. Reach the people you want to do business with. Target top prospects that you know you need to reach, but otherwise can't get in front of. Drive more health care FMs directly into your purchasing funnel. the pdf the user should get after filling out the form. Should be optimized for digital. Make a big impression with one of these take over ads. 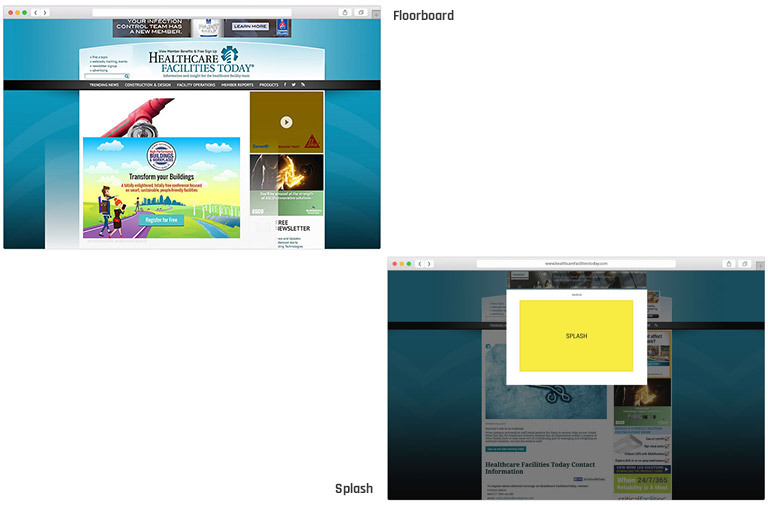 The Healthcare Facilities Today Splash and Floorboard ad opportunities are high-visibility way for you to promote your brand. Your ad will repeatedly welcome visitors to the site and leave a lasting impression. Now you can with the HealthcareFacilitiesToday Mobile Site Ads! Take advantage now and gain exposure to on-the-go Healthcare FMs monthly. 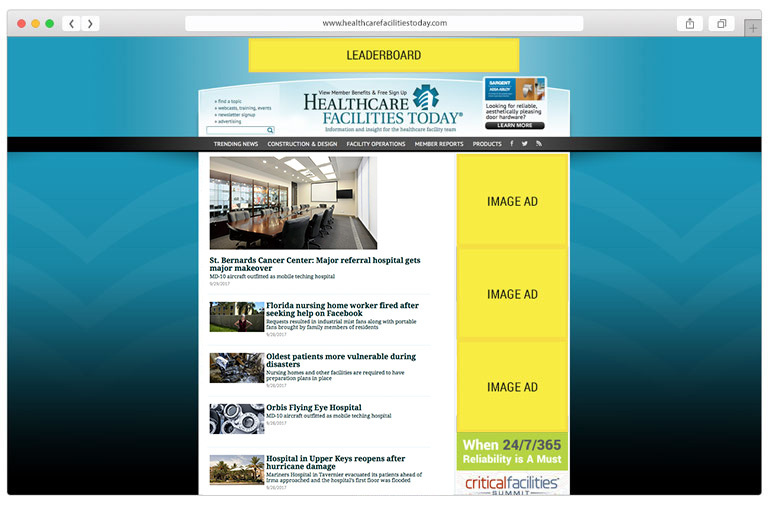 As an advertiser on HealthcareFacilitiesToday mobile, your ad will be displayed on every visit to HealthcareFacilitiesToday from a mobile device - use your ad to build brand awareness and increase web traffic with no competitive ads in sight! As the web moves towards mobile-friendly websites, position yourself on the cutting edge of technology with HealthcareFacilitiesToday mobile. Whether visitors come from search or email, direct or referral, your ad will be front and center for the duration of these high-value visits. You will receive reports detailing interaction with your ad in terms of monthly impressions and clicks. 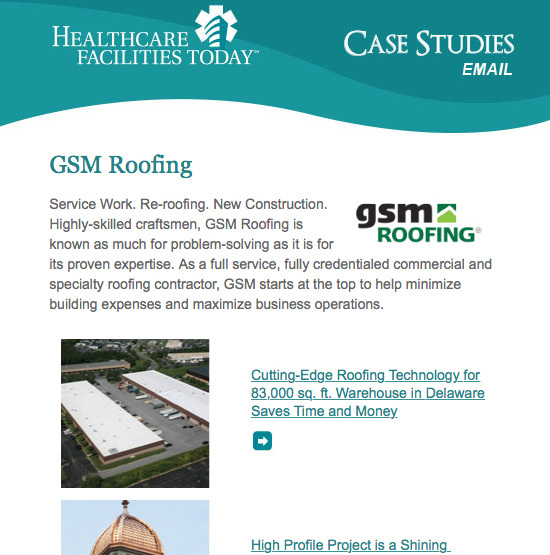 A daily e-newsletter (Monday - Friday) that provides a quick read and links to articles and items of interest for healthcare facilities executives and construction management professionals. Reach more than 25,000 hard to reach facilities and construction management decision makers at healthcare organizations one day of the week (Monday thru Friday). This is the ultimate way to maintain brand awareness in this niche market. Sponsorships are available in daily, monthly, or yearly increments â€” giving you multiple options of exposure. Your report will include the names, titles, companies and street addresses where we have them for recipients who click on your ad. AU DataMine is built on the largest and most comprehensive database of FM decision-makers. As a result, you save time and money trying to identify new customers. We are constantly identifying new decision-makers, using our experience with audience building in the facilities marketplace, who fit your buyer profile. Tell us your desired buyer profile and we will build a targeted list of facilities professionals that fit your specific parameters. We build your custom list using a combination of geo, job title, and company type to hone in and make your marketing campaign count. Use our advanced purchase-potential targeting where we build a custom list of individuals who look most interested and most likely to buy your product. Our audience analytics experts will, using behavioral indicators, analyze our audience data to pinpoint your most likely buyer candidates. They will then recommend the best options for you to reach them. 4. We identified key-target FMs via user engagement behavior with actionable requests. The campaign achieved over 500 engagements from 338 high-level facilities professionals. 5. We helped drive sales leads by directly connecting our customer with these key individuals so they could continue the lead development and sales process. The customer added these 338 roofing decision maker prospects to their CRM with the email addresses and full contact information we provided. Provide a subject line with a maximum of 50 characters, including spaces and punctuation. Clients opt-out/unsubscribe link must be embedded in the HTML along with a physical address. 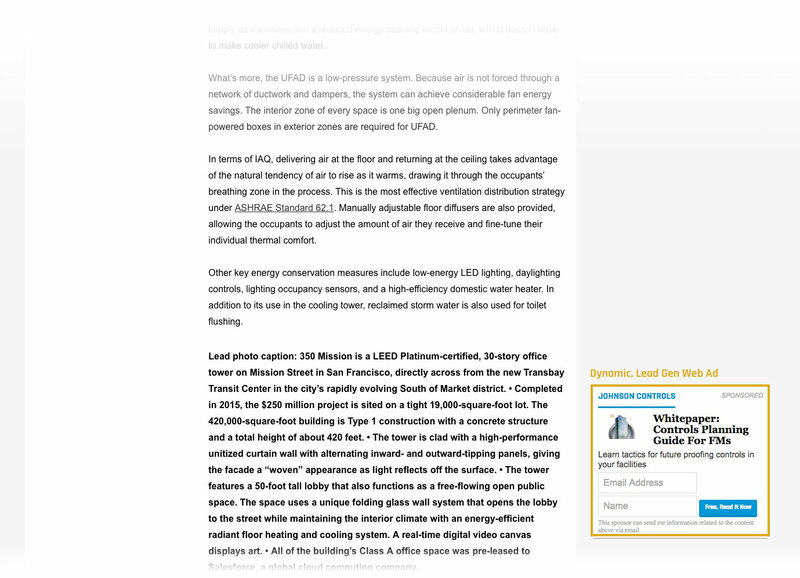 Link indicates user request to receive manufacturer's eBook, Webcast, WhitePaper or similar highly-valued content piece. Sponsor an electronic newsletter with content specific to your business. Your Custom eNewsletter reaches buyers interested in your business solutions. Your report will include the names, titles, companies and street addresses where we have them for recipients who click through on your content links. Choose a circulation size to meet your needs in 1,000 increments. Minimum order: 3,000 names or $1,200 min charge. Your report will include the names, titles, companies and street addresses where we have them for recipients who download the whitepaper. Your report will include the names, titles, companies and street addresses where we have them for recipients who click to watch your video. 3 case studies (as pdf's) along with headlines for each case study. 3 headlines and 3 URL links to the case studies. Please email the case studies directly to webads@tradepress.com. A proof will be sent to you prior to the mail date. 5(or less) slides 1280 x 720 pixels. Sole-sponsored, custom contentâ€”you choose your topic. We'll assist in copy review, slide generation and provide experience and expertise to assure a successful event. Journalists who know the healthcare facilities management market will write a 500 to 1,000 word customer case study or product application note based on email and/or telephone interviews with the customer you provide. You can supply photos, charts or other artwork, or stock photography and other graphic elements can be provided. You receive a PDF laid out in your template or in a template we provide. Journalists who know the healthcare facilities management market will write a 2,000 to 3,000 word thought-leader report based on email and/or telephone interviews with a mix independent industry experts and/or your internal sources. Can include customer examples or case studies as available. Can be based on original research for an additional cost. Project managers who know the healthcare facilities management market will work with you to create an attractive and educational Webcast presentation consisting of either a moderator and 1 to 3 expert sources, or a single presenter (FastCast). You select the presenter(s) and moderator, and you control the content. Webcasts and FastCasts are promoted and presented as live events, and you can ask up to 4 polling questions during the presentation. Questions from attendees are captured in real time and are answered and after the main presentation is over. 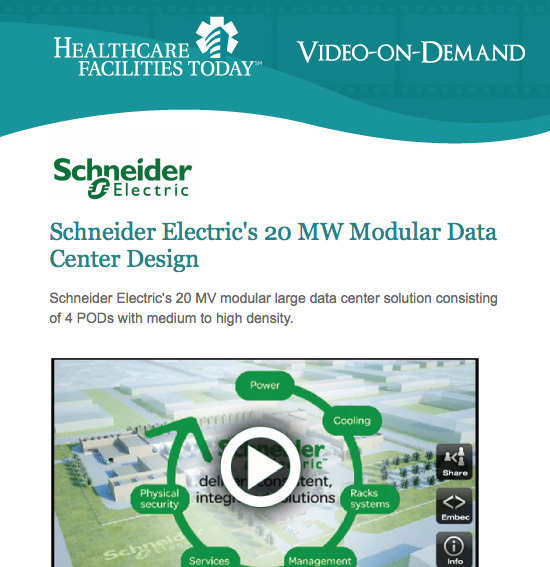 Webcasts are archived and available on Healthcare Facilities Today on demand. Researchers familiar with the healthcare facilities management market will work with you to conduct market research using the FM industry's most comprehensive database. A member of Healthcare Facilities Today's expert editorial team will provide project management and consulting services to help define the scope of the project and deliver results. You will receive a written report with charts. Original research can be made part of other content deliverables, such as whitepapers or webcasts. 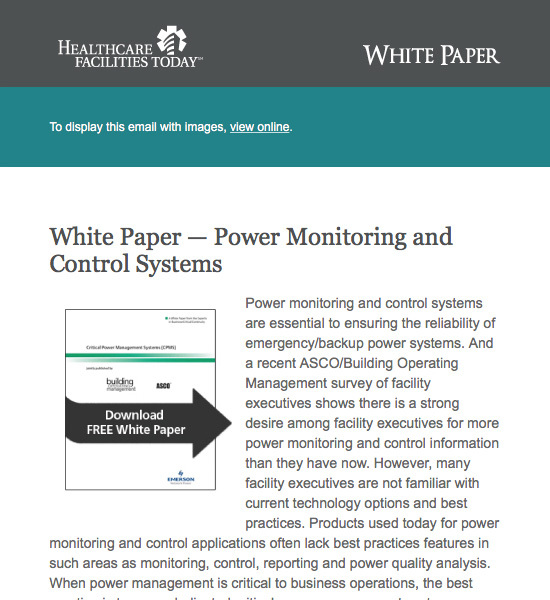 Journalists who know the healthcare facilities management market will write a 500 to 1,000 word technical, how-to or other article based on email and/or telephone interviews with the customer you provide. Our writers will ask about your goals and information objectives and help you craft a message that meets those goals. You can provide photos, charts or other artwork, or stock photography and other graphic elements can be utilized. The Medical Facilities Management database gives exclusive access to facility executives and top level maintenance management and key purchasing personnel at the nation's largest medical and healthcare facilities. Need a landing page or gated form for your digital campaign? We can help. An easy way for you to gather the user information you're looking for from your eNewseltter, email or website ad program. We can develop a gated landing page for you to help you gather user emails or other information you would like to collect. To maximize usage, we suggest keeping the number of fields to a minimum. Users will be more likely to use your form if they perceive a high level of value exchange for their information. Make sure you communicate the value of what they will get when the complete and submit the form. Landing pages are a standard in digital marketing to help focus and accomplish the marketing goals for a digital campaign. We can put together a landing page for you that focuses on your brand and drives home your message to the audience. We can work with you to develop something memorable and relevant to your ads. * For a landing page with a more complex scope we can give your a custom project price. Branded features appear in the news feed along trusted and topical content from HealthcareFacilitiesToday. You have a message and you need it in front of this audience of decision makers. 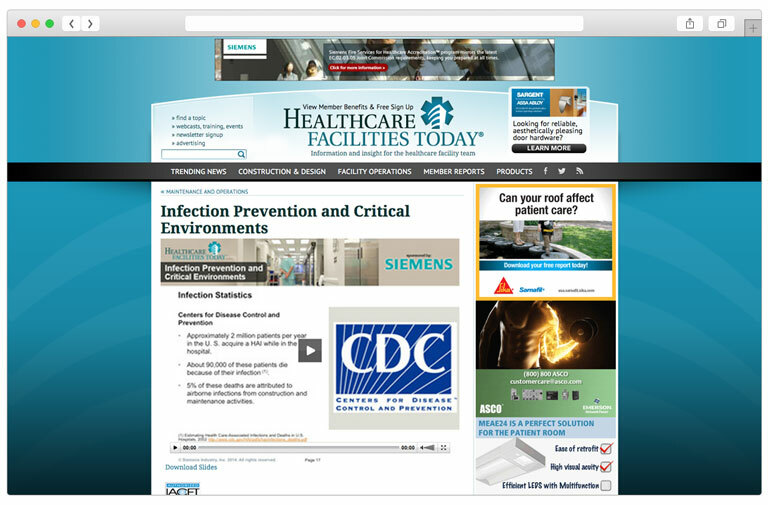 While HealthcareFacilitiesToday.com averages more than 15,000 unique visitors per month, its print supplements extend your reach to the qualified circulation files of Building Operating Management and Facility Maintenance Decisions' executive building ownership, facilities management and maintenance/engineering decision makers in the healthcare sector. Four times a year in 2018, place your ad among highly targeted content going to more than 21,000 healthcare facility executives. Plus, a virtual edition of the supplement is made available to 25,000+ Healthcare Segment Professionals via our Facility Pulse daily email. Energy Efficiency - Whether it's in new construction or renovation, which products, equipment, design features and practices are healthcare facilities using to conserve money and energy? Patient experience renovation ideas - When healthcare facility managers choose flooring, what are their priorities/ options? Infection control vs. green cleaning best practices - How do facility managers balance protecting patients and the environment? 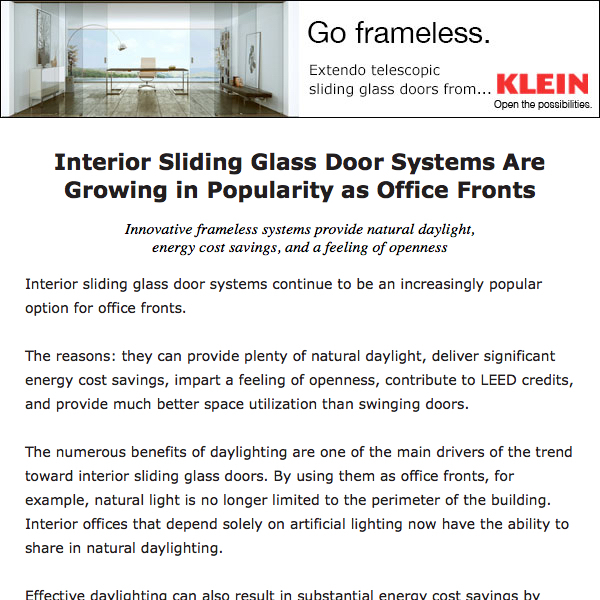 Lighting retrofit project â€“ How can lighting and control upgrades save energy and pay for themselves? Acoustics â€“ Noise levels can affect staff healing times and staff satisfaction. How can healthcare designers and facility managers keep things quiet? Building to curb Legionella risk - It takes smart design and maintenance to make sure healthcare facilitiesâ€™ water supplies are safe. 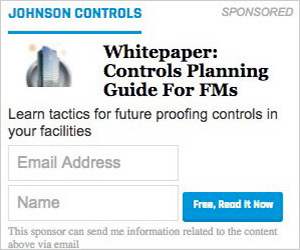 What should facility managers be doing? HVAC for infection control - Which products, practices help facility managers maintain safe indoor air quality? Security - Balancing safety & comfort. Healthcare facilities offer security teams unique challenges. How do they keep staff, patients and visitor safe? Physical tools in cyber security battle - What can facility managers do to maintain a â€œbrick and mortarâ€ hospital that supports cybersecurity. Fire safety - Which products, equipment, design features and practices are healthcare facilities adopting for fire safety? Internet of things for the facility manager - What challenges and opportunities does the increase in connectivity offer facility managers? 1/2 Page Horizontal 7" 4.875"
1/2 Page Vertical 3.25" 10"
1/3 Page Vertical 2.125" 10"
1/3 Page Square 4.5" 4.875"
NOTE: Pertinent matter on bleed advertisement must be kept at least .5 inch from any image edge. Bleed trim is .125 inch. Upload your ad materials to www.tradepress.com/uploads (please include a pdf soft proof when uploading ads).